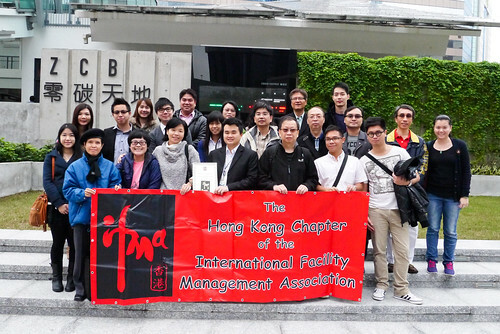 With a preview opportunity before Zero Carbon Building (ZCB) officially opened 5 January 2013, IFMA has arranged a facility tour to our members to visit Hong Kong’s first zero carbon on 8 December 2012. ZCB is a three storeys building located at Kowloon Bay, and has a total area of 14,700 square meters. The building is developed by the Construction Industry Council’s (CIC) in collaboration with the Hong Kong Government. Its key components include indoor and outdoor exhibition spaces, a multi-purpose hall, an eco-office, an eco-home, as well as outdoor landscape areas with Hong Kong’s first urban native woodland. ZCB adopted an integrated approach by combining passive design measures with green active systems - utilizes solar panels and on-site generation of renewable energy - biofuel made of waste cooking. The project provides an education platform to showcase green building technologies and low carbon living to us. In addition, it served as a laboratory to test various green products, such as urban woodland promoting bio-diversity and local plant species. Through the exhibition of 3D video on climate change, reflective insulating radiant barrier, and green active system plant rooms, our participated members share knowledge and expertise in low carbon building design and technologies. In visiting their Eco-office, Galley and Eco-home, participants understand more about the green applications in operation. All participated members showed a great interest in ZCB’s series of passive strategies and raised many questions in how these features could apply to improve energy conservation and thus reduce energy consumption. For a FM profession, ZCB visit is a good opportunity to update the best practice in the industry and benchmark the green operation. All participated members enjoy the tour and experience the state-of-the-art eco-building design inside ZCB.